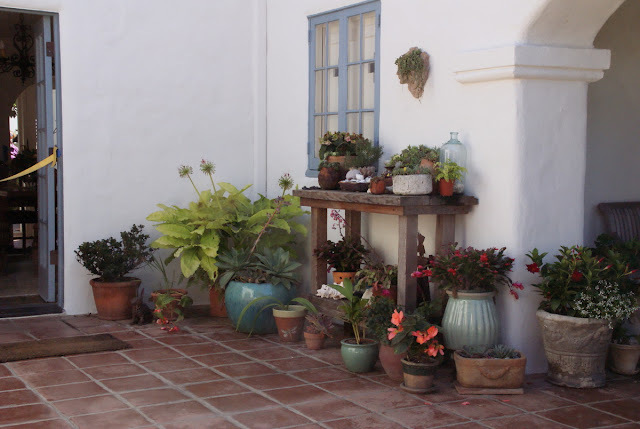 This post continues with the garden tour through Nan Kaufman's garden. There was really a lot to see. I hope you enjoy the rest of the tour. ...and that I had never seen before. 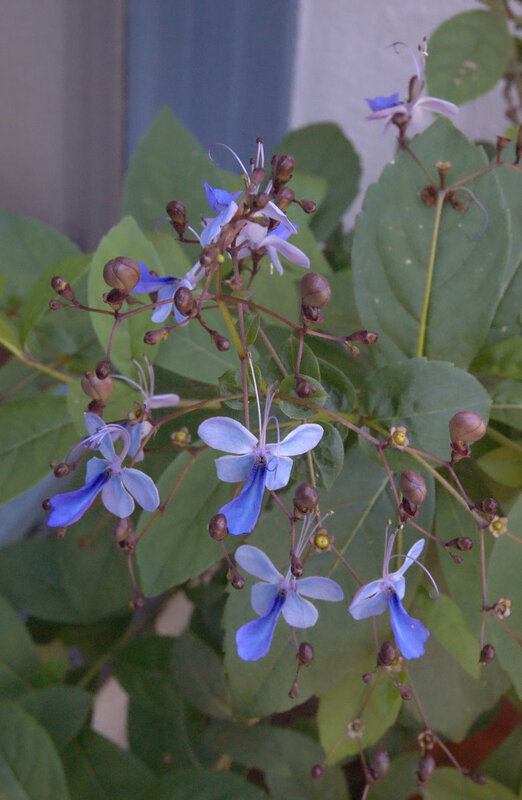 Its name is Cleodendrum Ugandense, African Butterfly Bush. Aren't the dainty flowers pretty? I wonder if they really attract butterflies. 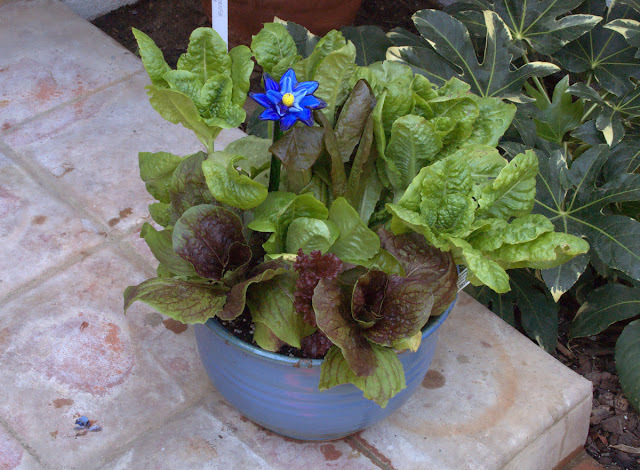 In front of this plant was a beautiful container filled with different yummy looking lettuces. The blue flower seemed to be made out of glass, adds color, and is certainly very eye catching. 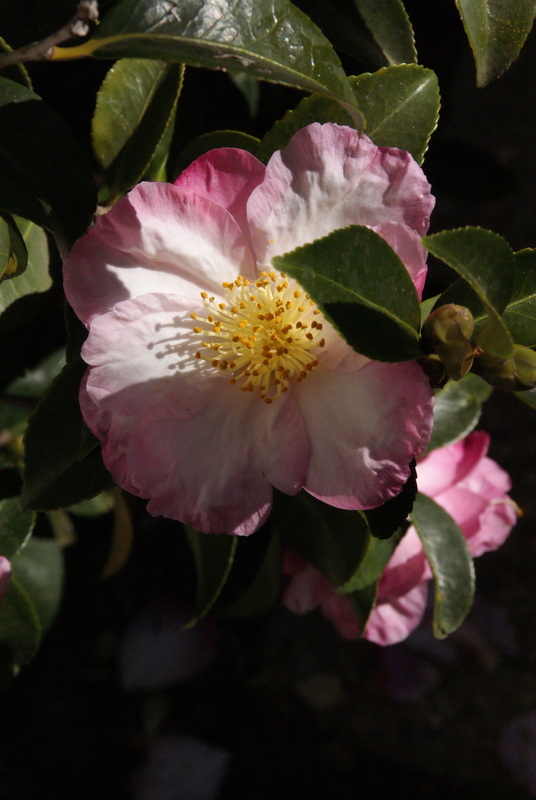 Walking further we passed this very beautiful camellia. I was astonished that it was in bloom already. 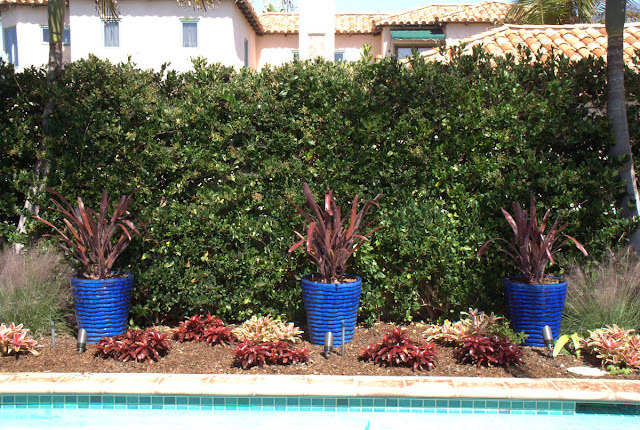 Decorating another corner in the back of the house we found this vignettes of three blue glazed terracotta containers. The shape of the containers was quite modern and even though modern is usually not so much my thing, I liked those quite a bit. 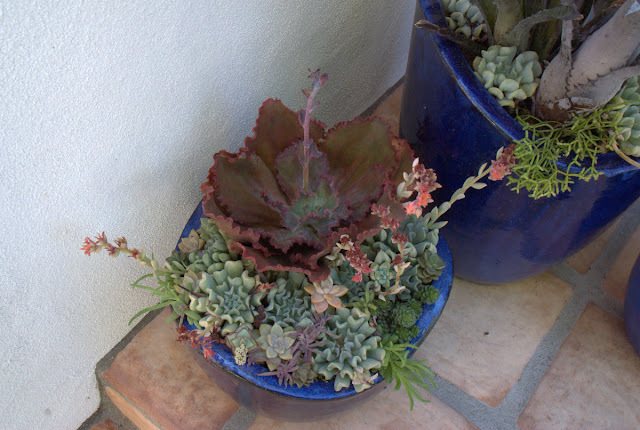 Here is a close-up of one of the containers shown in the photo above so that you can see the succulent mix a little bit better. Stunning, huh? Then we reached an area with a pool. I found the landscaping around the pool quite interesting. In this section of the garden they used more of the modern shaped blue containers this time filled with red leaved plants. 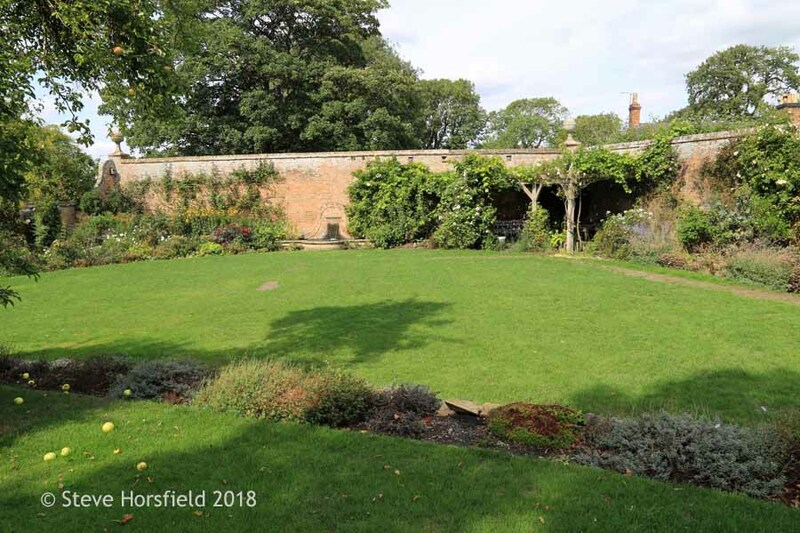 The pots were accompanied by succulents planted in the ground together with grasses which makes a quite unusual combination. It is certainly one, that at least I have never seen so far. A more frontal view of the same area. View of the same area but this time looking a little bit more to the right. I still can't get over the combination of succulents and grasses, I certainly would have never thought of doing this. 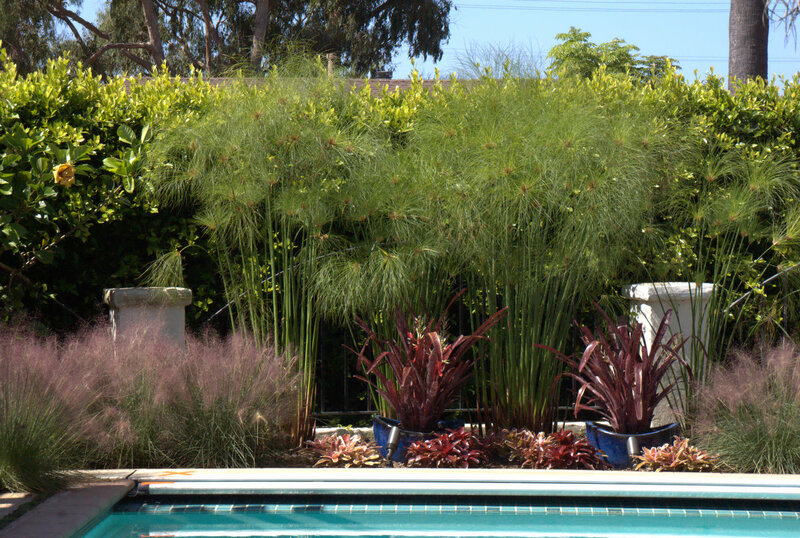 The other side of the pool was landscaped like you can see in the photo above. 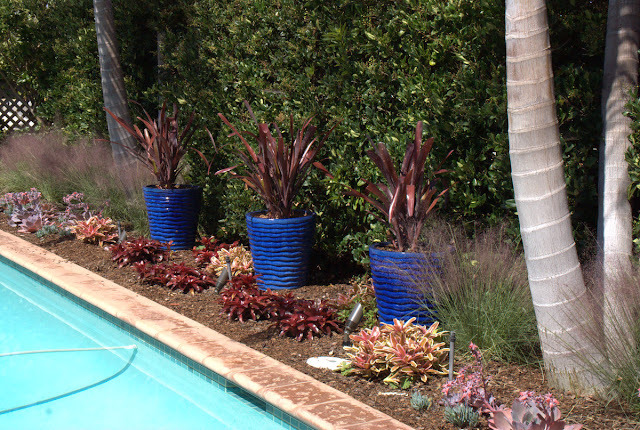 Repeating the use of blue containers planted with red leaved plants, surrounded by grasses and clumps of cyperus papyrus. Very interesting! 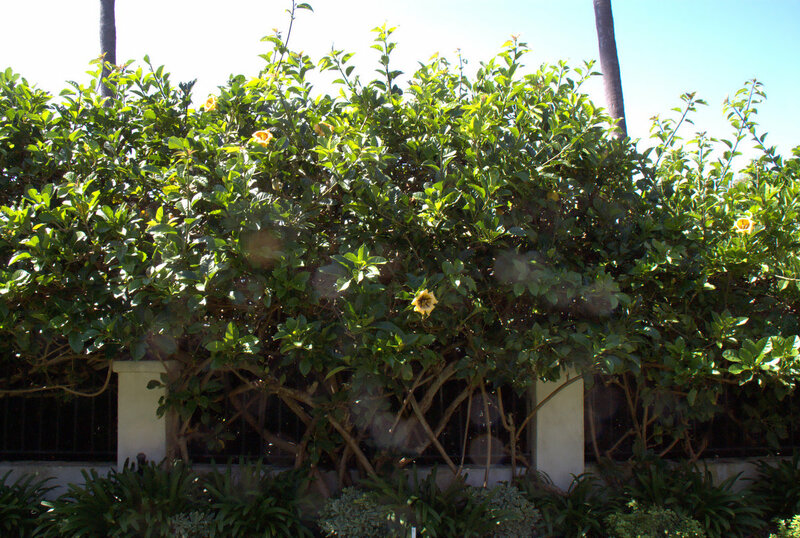 In the background you can see a dense hedge of a plant, which I will show later a little bit more closely. In an outdoor kitchen area they had placed this cute bowl with a moss teddy bear. 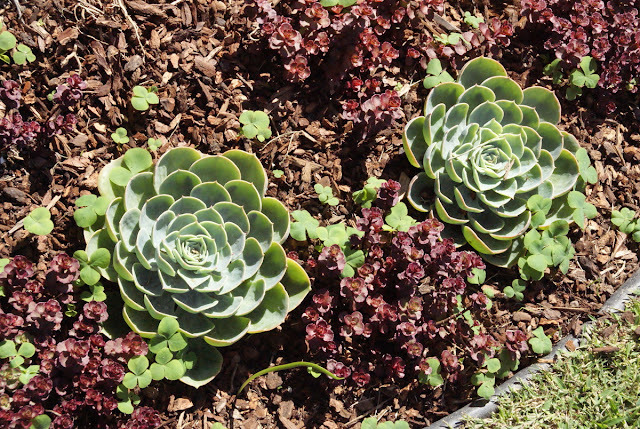 You also could find here another pumpkin planted with succulents. I liked this one best, because it is a white pumpkin, and white is my favorite color. A clear saturated orange is my least favorite color, by the way, so orange pumpkins are usually not for me. If you look closely you can see a little advertisement card in the background of the pumpkin that points out that obviously someone "professional" did do the succulent plantings for the garden tour not the owner herself. This was probably my favorite succulent arrangement. How neat is it to plant them in a giant seashell? Just loved it! For my personal taste this is a little bit over the top but a fun thing to look at for a garden tour. 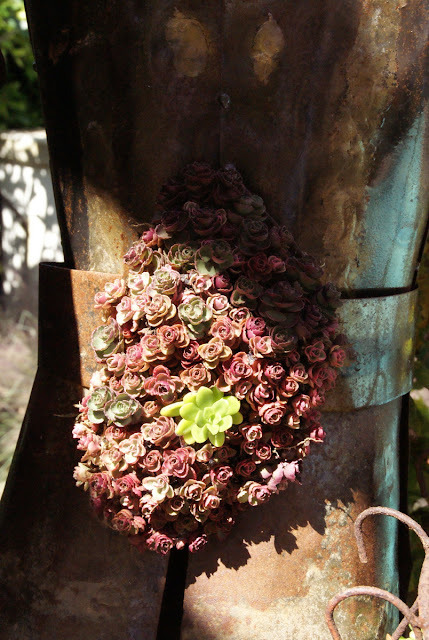 A metal Don Quixote sculpture planted with succulents. It definitely was the ultimate conversation piece. This a close-up of the belly of the Don Quixote sculpture. This succulent arrangement contained so many tiny succulents, simply unbelievable. 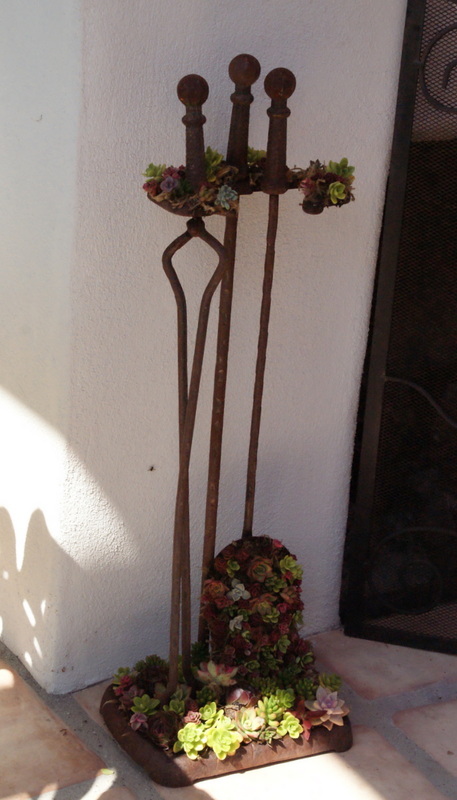 And here they had planted succulent on the fire place set. Of course now it is useless for the fireplace, but it is a fun idea to do that. The miniature succulents are quite amazing. I have never seen so tiny ones used in plantings. 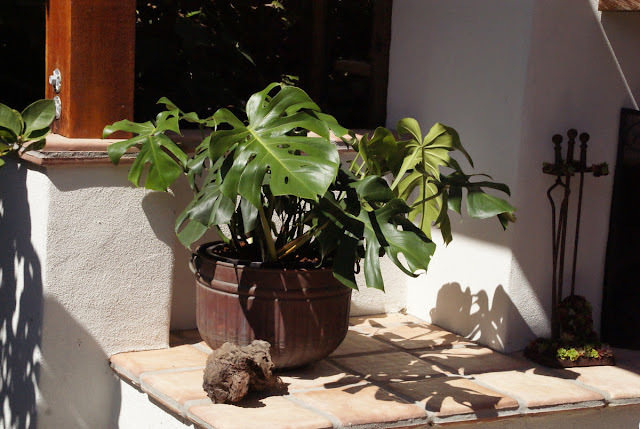 I was in love with this monstera deliciosa. 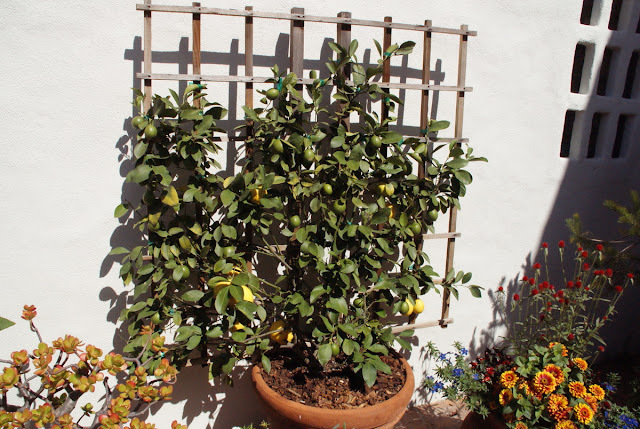 I think, they just placed the plant there for decorative purposes for the garden tour only, because I assume our strong sun would burn it, if it would be out there permanently. But in any case this is a great indoor plant that I was growing twice in my life and I think seeing it on the garden tour again pointed me in the direction to get another one for my own house to live indoors with us. Continuing with more "regular garden stuff". How about this beautiful tall bearded iris? The name of the variety is 'Frequent Flyer'. 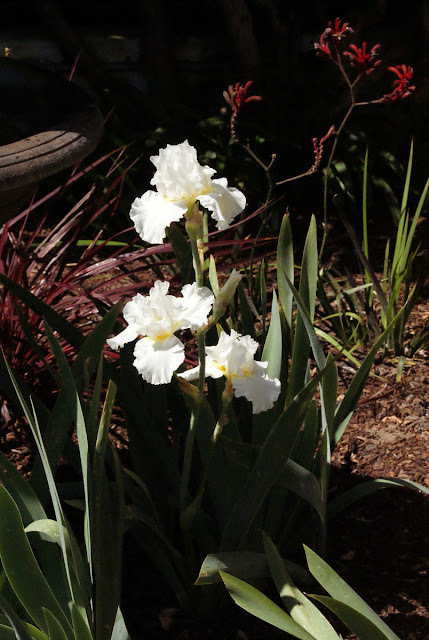 I do not get it why some people in San Diego can grow irises so lovely like this one and mine just sulk. It is a real mystery to me. On the photo above you can see the whole bed in which the iris was growing. I like the water fountain and in general feel, that this area was well done. The bed seems to be fairly new and just has to grow in a little bit more then it will be perfect. 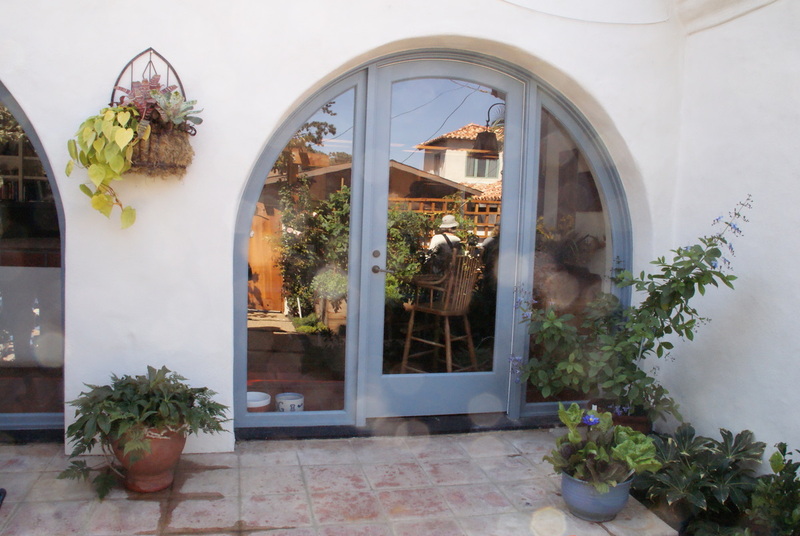 Another intimate patio area. 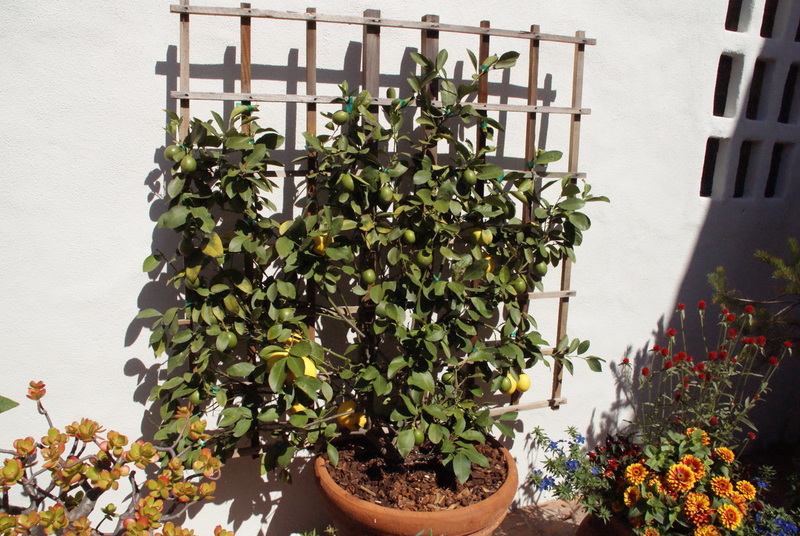 On the photo above you can see one of the many espaliered citrus trees. It looked pretty healthy to me and was bearing plenty of fruits. Above a shot of the whole area with many more nicely potted plants. On the opposite side of the patio it looked like this. I am seriously wondering who is watering all the containers in this garden? 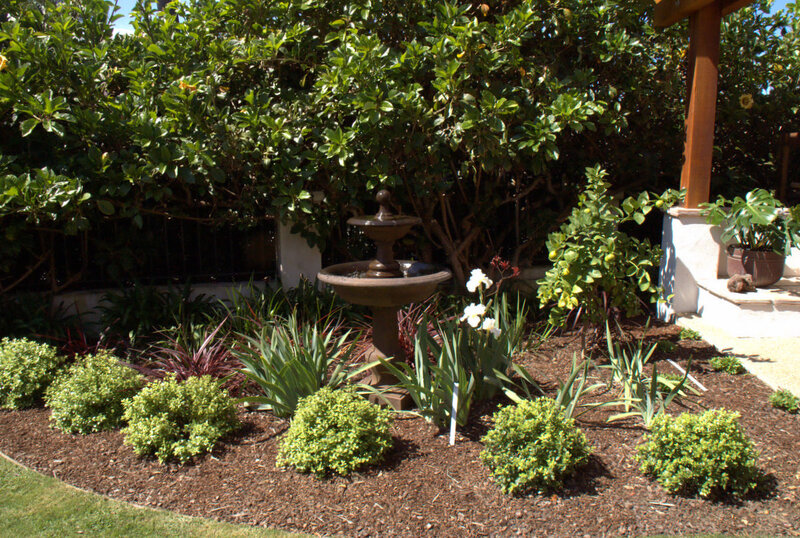 As lovely as they are it is really work to water as many containers as have been scattered around in this yard. This is a plant that is really fascinating to me and which you have already seen growing in the background of the pool. 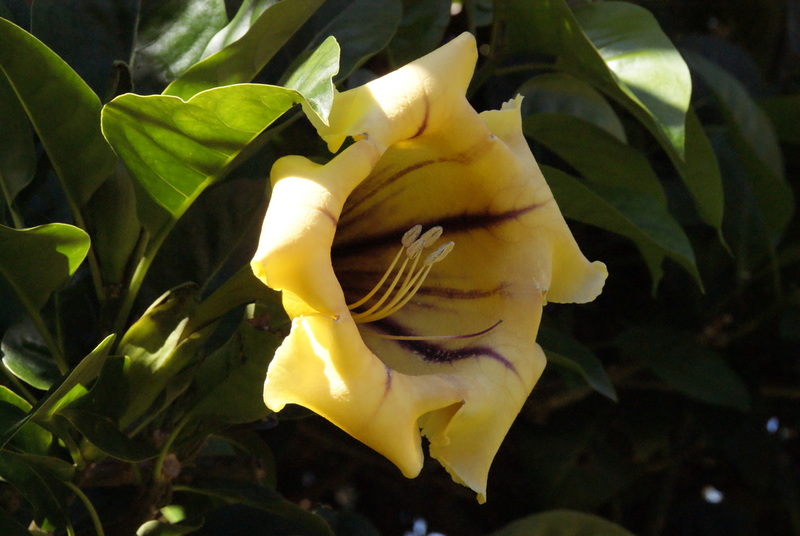 It is called solandra maxima or Cup-of-Gold vine with the common name. 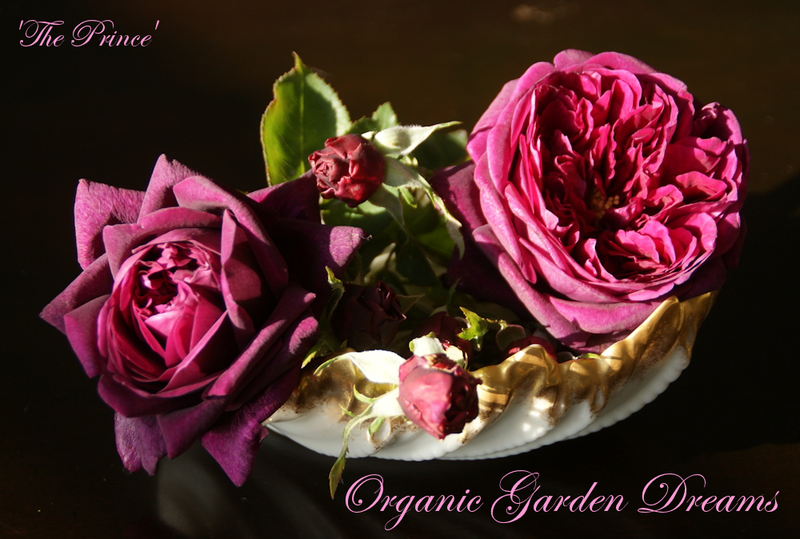 The plants in the garden are supposed to be twenty five years old and they were simply wonderful. They were building a hedge around one side of the property, which was giving the owners complete privacy. This photo shows a close-up of one of the giant blooms of the vine. Aren't they drop dead gorgeous? 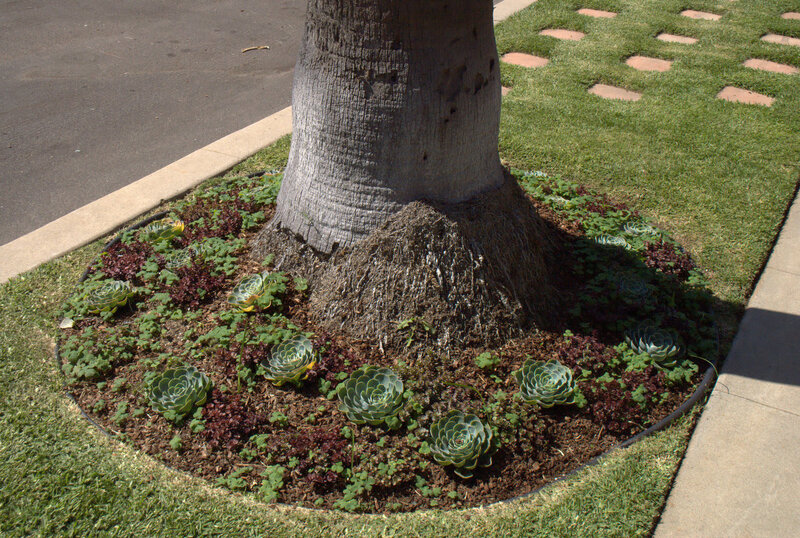 On the way out of the garden I noticed that even the beds at the feet of the Queen Anne Palms between the sidewalk and the street were underplanted with succulents. To me that looked really great and it is for sure a drought tolerant planting! 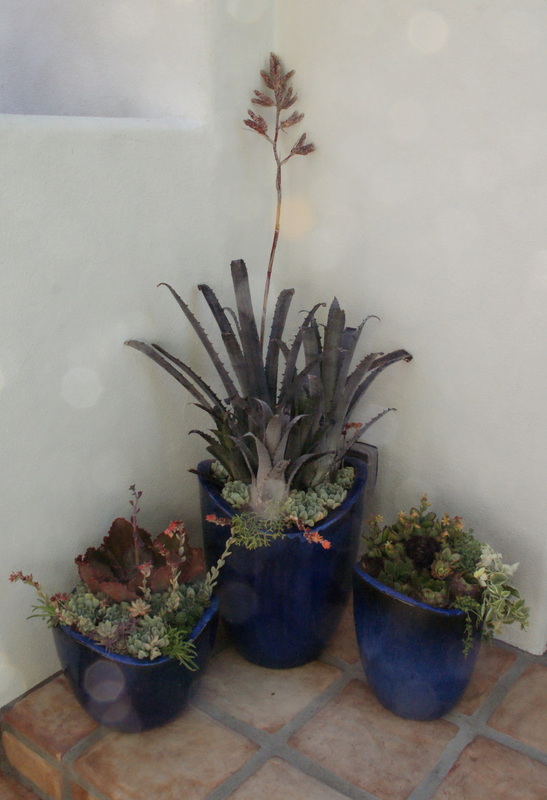 Having a closer look: The blueish/greenish succulents are building such a great contrast with the red ones. Stunning! Altogether I got a lot of ideas from visiting this garden and felt very inspired to make my own little garden more pretty with the means that I have. 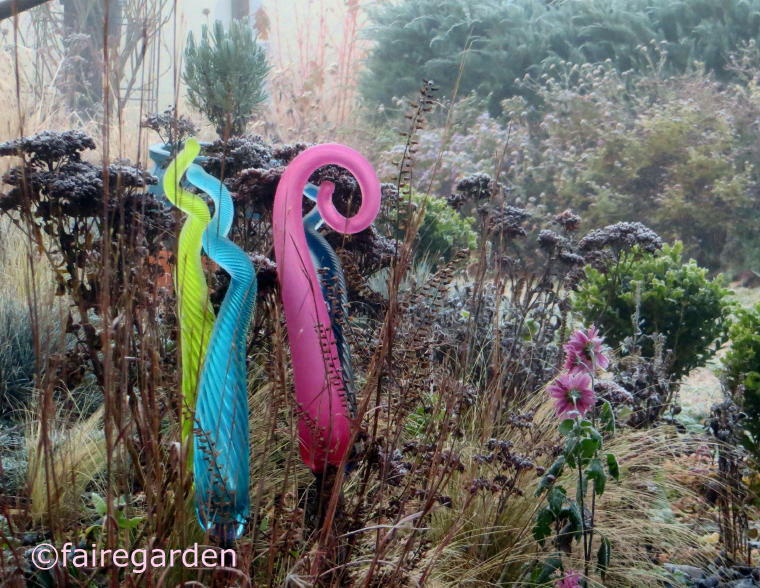 For me attending a garden tour is always worth it and it is so much fun. 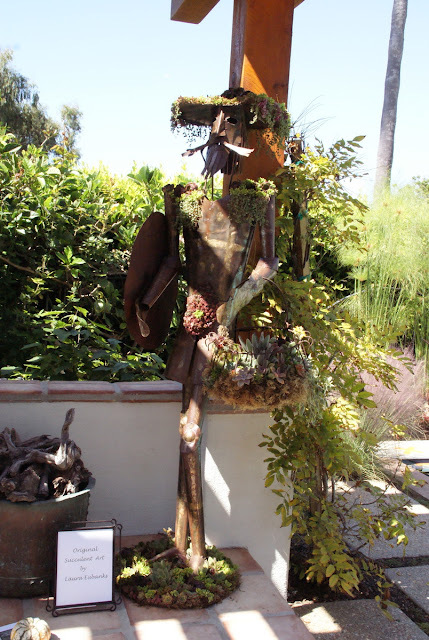 Are you enjoying to go to garden tours, too? What a lovely post you share with us. I love the clerodendron ugandese. Our winters are to cold to leave here outside. To me she is not easy to grow. So many interesting ideas in this garden. Thanks for sharing! The best part was the angle with the potted plants ... Lovely garden, again ! Marijke, thanks for your nice comment! Sounds like you are growing cleodendrum ugandese yourself. How exciting is that? I have not looked up the needs of the plant, but I can imagine that it can't take frost. Wishing you a nice week, too! hundredsofideas, thanks for visiting my blog. You are completely right there are a lot of interesting ideas to find in this garden. Dani, thanks for your comment. 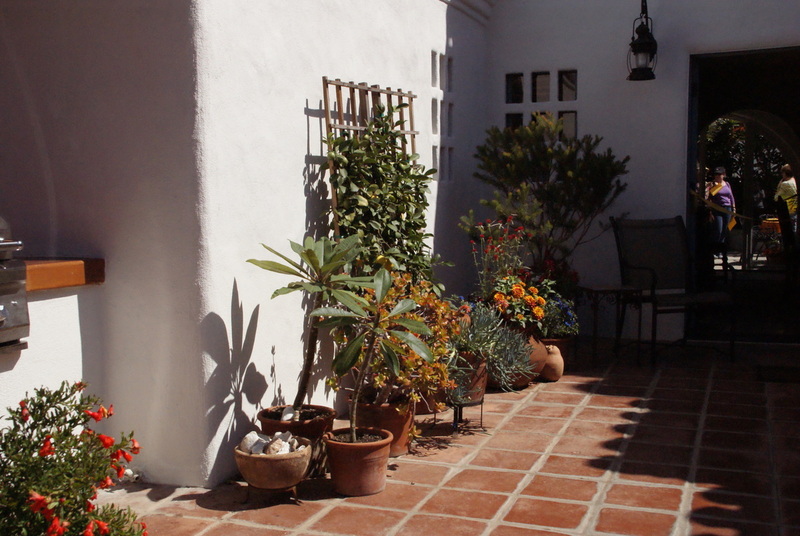 I am glad that you liked the garden and especially the plants potted up in the containers. I really like all the succulents - especially all the tiny ones. I have heard of cup o gold vine, but never seen one. It looks amazing. Love all the blue pots, too. Holley, thanks for your comment. The tiny succulents are cute, aren't they? The Cup-of-Gold vine is truly amazing. The flowers are so big! In fact, Surgery came back to our property to make sure the fence met his expectations. The mom, Olga was fantastic to deal with over the phone. She answered all my questions thoroughly and replied promptly to my emails. Best Fence Contractor is the way to go if you’re looking for a fence company who will exceed all expectations Look at this web site. ... And What is Cooking in my Own Garden?